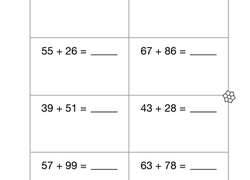 Get your kids adding like pros with addition practise worksheets for number novices and more experienced mathematicians alike. 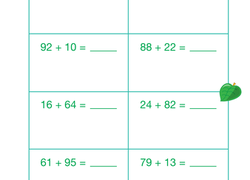 With lots of practise and exposure to different techniques and strategies, these worksheets will help kids master the ins and outs of this foundational maths skill, whether they’re working on addition within 5, multi-digit addition, word problems, or even trickier addition with decimal numbers. This fruit-filled year two maths worksheet offers a healthy dose of mental nutrition. 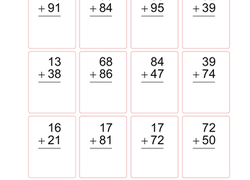 To complete it, your child will solve single-digit addition problems. 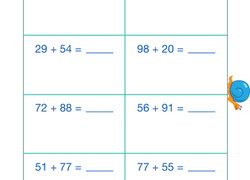 Got a second grader who's reluctant to practise maths? 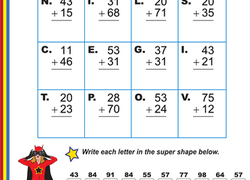 Addition loses its bore factor with a maths worksheet infused with extraordinary energy. Practise Addition with Charlie the Chef! Can your second grader add up these double-digit addition problems to help out Charlie the Chef? Your second grader won't mind practising double-digit addition when these alien accomplices give them a helping hand. 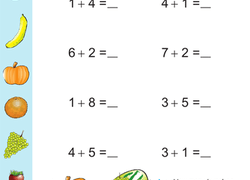 This double-digit addition printable has an extra bonus: a silly green monster to keep your second grader company! 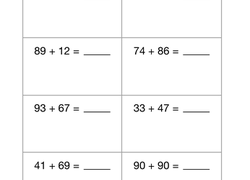 The smiling snails on this worksheet will remind your second grader to work carefully as he completes these two digit addition problems that involve carrying. Santa left some gifts, but they need a little colour. Your child will colour the gifts by number with the help of some addition and subtraction problems. Practise Addition with Fiona the Florist! If your second grader has an affinity for florals, this adorable worksheet may get her excited about addition! 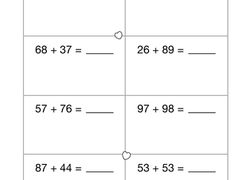 Looking for a new way to help your first grader tackle addition? Indulge in a little kiwi maths! 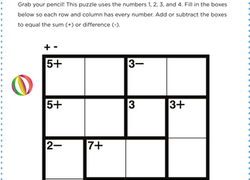 Do your students like puzzles? Then they'll love helping Sammy the Seal solve this one! To help your child get ahead in maths, give her this fun, fruit-filled addition worksheet covering single-digit addition problems. 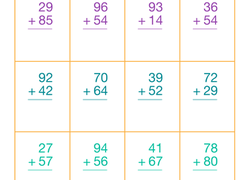 Give your second grader's arithmetic ability a boost with this colorful worksheet! He'll help out his good friend Betty as he gets some great maths practise. Has your second grader ever wanted to play super hero? 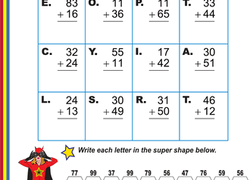 Let him do just that with this two-digit addition worksheet. After completing some difficult double-digit addition, your second grader will be delighted to move onto some creative coloring! 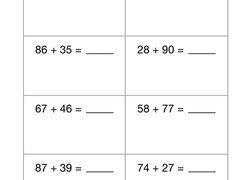 This fun worksheet is sure to motivate your second grader to practise two-digit addition, and it's great for mental maths, too! 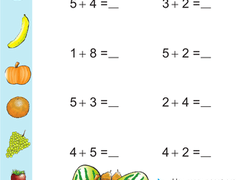 Make solving addition problems fun with this fruit-filled year two maths worksheet! 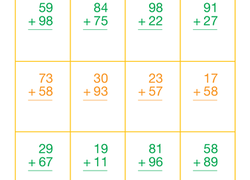 Your child will solve addition problems that add up to 10 or less. This charming worksheet--with an additional coloring activity--asks your second grader to rewrite and solve eight double-digit addition problems. 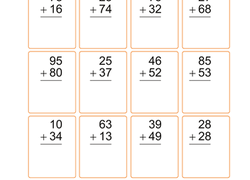 Looking for some extra practise with two digit addition? The butterflies flying around this worksheet will give your child just that. 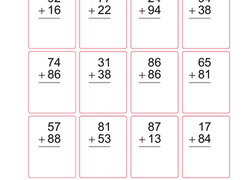 Try a new take on an old lesson by combining double-digit addition practise with a fun coloring page! Your second grader will be delighted with this double-digit addition worksheet that does double duty as a fun coloring page! 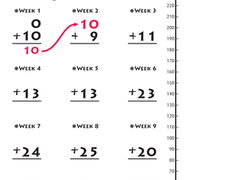 Young kids who are beginning to learn addition often need to see a visual representaion of any given problem. Many kids will use their fingers and toes, but make things more fun by using counters. You can use pieces of cereal, beads, mini marshmallows or anything you'd like. Kids love switching things up with large-sized counters, so bust out pillows or purses to make learning addition even more fun. Get some addition practise while reading picture books together. There are a tonne of great picture books that have overt and hidden addition facts and practise, but you can turn any book into a lesson in addition. If you read a page with a picture of a forest, you might say to your child, "I see three trees and four flowers. How many plants are there all together?" You can add characters, shapes, items, or anything in multiples. 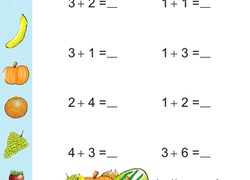 Encourage your child to work on a new maths addition worksheet everyday to keep adding skills fresh. 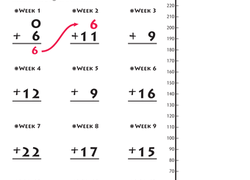 Mix things up with basic addition worksheets and more challenging exercises, and even a few addition facts worksheets to keep your child engaged with the subject.